It's unusual for me to have non-GM items in my collection, especially anything as weird as these early 70s Mini Clubman wing trim panels that I came across whilst clearing out my loft. 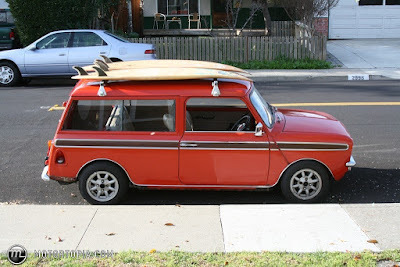 To the best of my knowledge they were for the rare early 70s Mini Clubman "woody" estate model. There was a metal section with the Fablon style faux wood finish, it had sun fading and flaking of the finish on the outer side and some light rust visible on the inner side. There were also two brightwork trim pieces which were in quite good condition, all bright and shiny with no dents, etc. Given the scarcity of such parts, I wanted these items to go to an enthusiast, rather than the scrap bin. I posted on a few Mini enthusiasts' FaceBook groups and found a buyer in under a week. This has proved to be a much easier process than finding new homes for classic Opel spares, hmm, I'm in the wrong business.